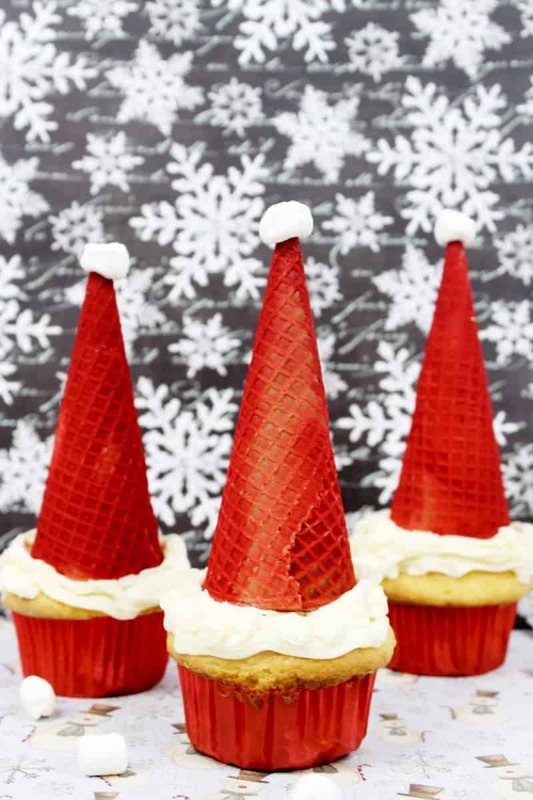 Santa hat cupcakes are made by topping cupcakes with red sugar cones and a mini marshmallow. These fun and easy Christmas cupcakes will definitely be a hit! Are you looking for recipes that you can make with the kids during the holiday season? 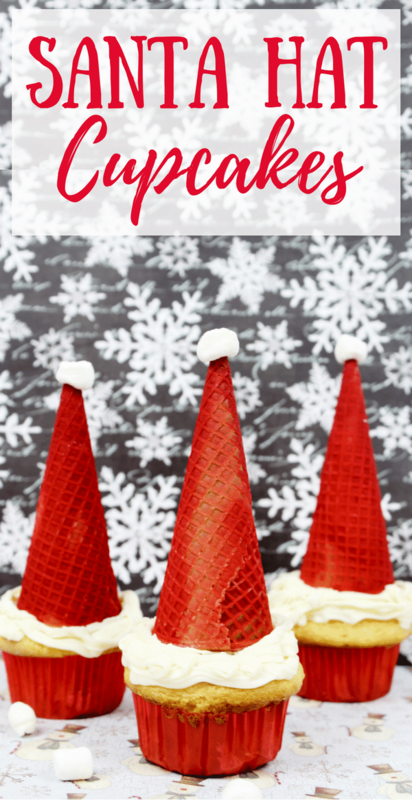 These santa hat cupcakes will be perfect and the kids will love helping to make them. 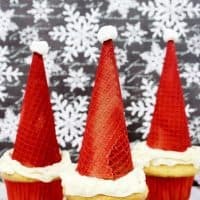 All you need to make these adorable santa hat cupcakes are prepared cupcakes, vanilla frosting, sugar cones, mini marshmallows, and Red Color Mist Spray. 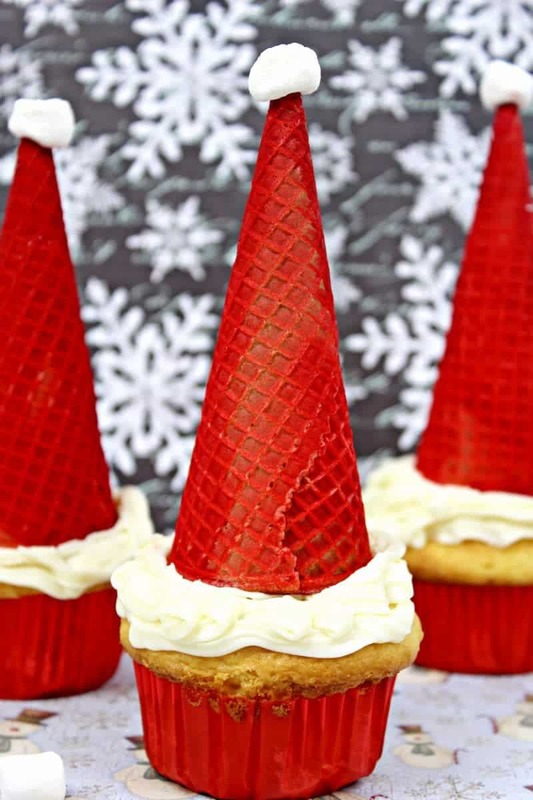 This recipe for Santa Hat Cupcakes is so simple that kids of all ages can help. Start by making vanilla cupcakes, using either a mix or from scratch – totally up to you. Then, ice with vanilla frosting. Store-bought frosting works just fine, but you can make your own if you prefer. Now, have the kids jump in and help turn those cupcakes into Santa hats! Don't forget to set something under the cones before you spray them, especially if your kids are helping to make them. Make sure that you completely cover the surface you, or the kids, are working on so that you don’t end up with red countertops or a red kitchen table! There may be nothing difficult about this recipe, but the finished product sure does look awesome when it's done. These Santa hat cupcakes are perfect for large get togethers, bake sales, or any of function where you want to impress people, but don’t want to spend a lot of time in the kitchen. These Santa Hat Cupcakes are sure to be a big hit with everyone this year. They are not only fun to make, but everyone will want one. They’re festive, colorful, and a great way to get everyone in the Christmas spirit. Pipe vanilla frosting onto cooled cupcakes and then set aside. 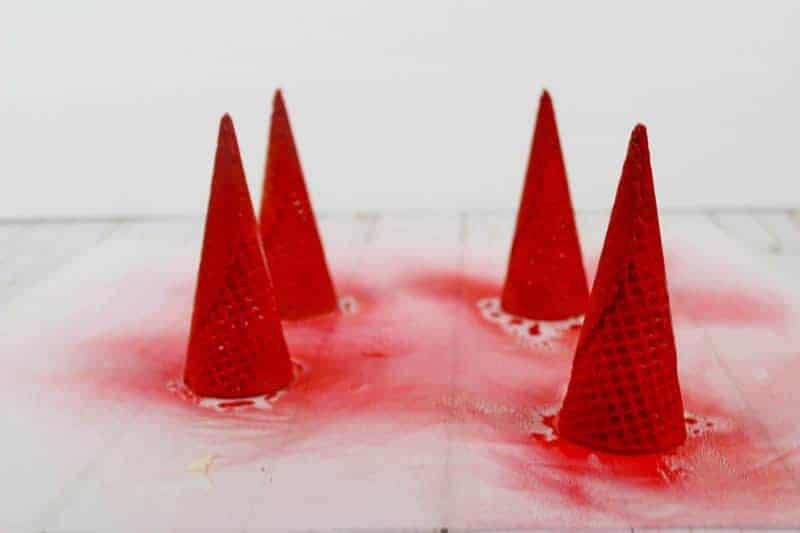 Spray sugar cones with red color mist. Set aside and allow to dry. Once the sugar cones (Santa Hats) are dry, place a dot of frosting on a mini marshmallow and then place on top of the cone. Set the sugar cone on top of the frosted cupcake. These look so cute and easy to make! Such a great idea for Christmas, the kids will love them. These are so cute and looks easy to make! Oh Boy!! I just know if the kids see these I’ll be baking them for our Christmas party. My niece will love to make these. Thanks! These are adorable, not sure I have the patience or ability to make them but would like to try. These are so fun and festive! Love them! These look so cute. Thank you for sharing. My grandkids would love these for Christmas. These are so adorable! I can’t wait to try them.